With each new game, Blizzard breaks some record. 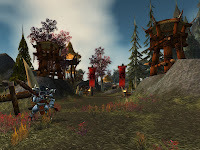 Now it’s the new expansion to World of Warcraft, Cataclysm, which sold more than 3.3 million copies in the first 24 hours after being launched. It became the fastest selling PC game of all time, and the numbers, based on Blizzard company records, “include digital pre-sales”. Previously, Wrath of the Lich King sold 2.8 million copies in 24 hours. Cataclysm is expected to sell a lot more and ensure Blizzard that the WoW magic is far from over. The fourth expansion is already planned.